I moved the baby into the bathroom so I could enjoy a quick soak. 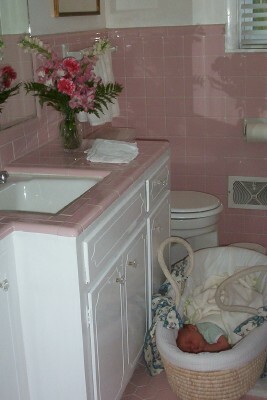 As I looked around at all the pink, I realized, I finally have a little girl with whom to share my girly bathroom! We are so blessed. Every day brings new surprises. Sallie, formerly of Two Talent Living, has unpacked her bags at A Gracious Home. She's celebrating the second half of surprise pregnancy with a look that befits her new focus. Also, congratulate Kristen of Walking Circumspectly, who's expecting after five years of prayer. Those of you who think I'm nuts for posting postpartum will have to visit Kim C. at Life In A Shoe--she plans to live blog the upcoming home birth of baby #9. Mothersong has revived her blog with a good two-part post about saving money with summer planning. The Common Room's Headmistress repackages her frugal choices in a summary of wants vs. needs. Great comments there, as usual. Aw! That's so sweet. I was so happy to have my daughters, too - and it gets even more fun to do girly things with them as they get older. Congratulations! I adore my sons, as I'm sure you do, too! Boys can be so sweet and loving. But there is something about having a daughter when you are a woman. I've had such pleasure (and hard times, too, of course) with my Katherine. She's such a blast. Just think...all that 'girly' fun is only just beginning for you! You're right! Her blog title, "the methods and madness of one mother of 7", threw me. I love your moses basket! Where did you get it/ what brand is it. Jasmine, my mom found it at a yard sale for $5. I have since seen the basic version at discount chains for about $30. I looked at some in a fancy baby boutique and loved the trimmings. I had some leftover fabric ribbon and tied big bows to the sides for decoration. Hi, I'm wondering where you got the neat basket bassinet in the picture on this post. I'm expecting my first baby and I love that basket!